Getting a good night’s sleep is an important element for an enjoyable camping trip. A few sleeping systems suitable for camping include sleeping bags, sleeping pads, hammocks, camping cots and air mattresses. The choice of either will be dependent on a couple of factors such as camping type, sleeping style, personal preferences and so on. Hammocks usually require little space to set up and do well in keeping you off the ground. They provide zero insulation and will require a rainfly to protect you against rainfall. Sleeping in a hammock can lead to back pains since your body weight will form a valley in the structure. 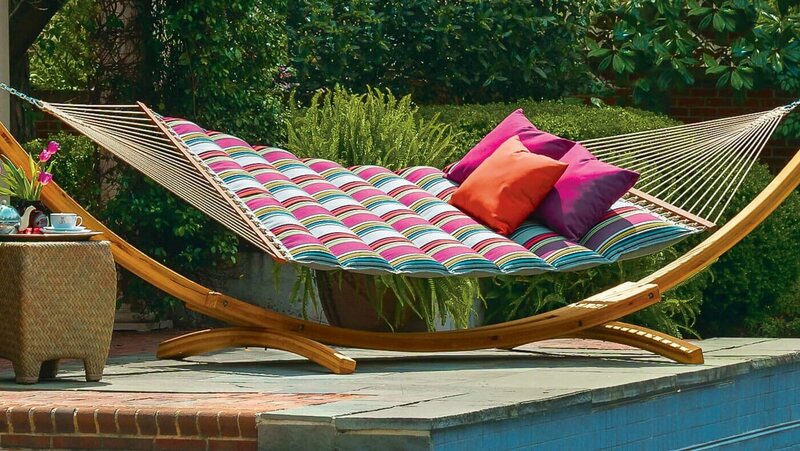 Hammocks are best suited for warm weather condition or just for lounging during the day time. Some campers opt for only a sleeping bag laid on the tent floor, which can turn to be very uncomfortable in a short while. 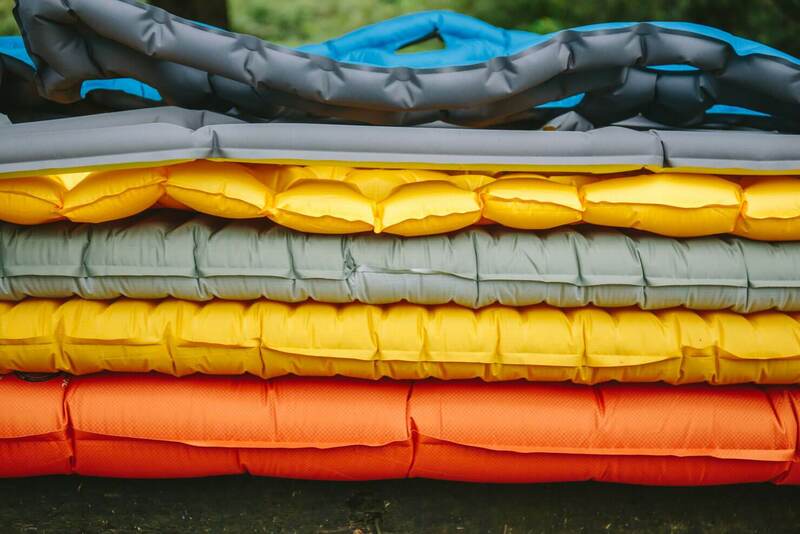 Sleeping pads are another alternative especially when used with a good quality sleeping bag. Sleeping pads are usually lighter and less bulky to store and carry, however this may require more insulation to counter cold nights. Investing in a more durable pad (PVC coated and waterproof) can help address loss of body heat. Sleeping pads with an open-cell foam construction excel in providing comfort and boosting insulation. The foam in the pads provides a firm surface to lie on while the foam cells trap in air for additional cushioning. A sleeping pad with an R-Value (thermal resistance) of more than 5 is more than ideal for winter conditions. The higher the R value the more insulation the pad offers. Camping cots and air mattresses seem to address the inefficiencies of the other sleeping systems more effectively. The cots and the air mattress prop you off the ground for a comfy night’s sleep. It’s especially a game changer if you use a cot, a sleeping pad and a sleeping bag together, if possible. A camping cot or camp bed refers to a small transportable, light bed that is used when regular beds are not available or suitable. It comprises of a foldable metal or wood frame with a nylon, polyester, linen or canvas covering to lie on. Camping cots are commonly used in emergency situations, army camps as well as for leisure outdoor camping. For prolonged camping periods, you might want to include a camping pillow and a foam mattress for extra comfort. The ideal camping cot should have an easily washable and comfortable fabric i.e. polyester or nylon. Canvas material may be more durable but usually very difficult to clean. The frames of the cot should be lightweight, rust-resistant, durable and easily foldable. Most cots have aluminum frames done in U or X-shaped designs. An air mattress, also known as a blow-up bed or an airbed, is an inflatable mattress that is in most cases made of polyvinyl chloride (PVC). Some are made of rubber. Air mattresses are very popular and affordable, and come in many designs for use in RVs, at home or in tents. A portable air compressor or a hand-held pump is used to inflate the airbeds for use. Air mattresses can be deflated and folded into a smaller size or shape for easy storage. Other handy airbed accessories to have include a repair kit, air pump and an optional chair sling. Foldable camping cots are the easiest to set up at camp. Simply unfold the frames and lock them in place and you’re set. Air mattresses on the other hand must be unrolled and inflated before use. This means if you have faulty valves or even worse if you forgot the air pump, then you are in for a grumpy night. There are self-inflating air mattresses in the market that use an internal electric pump to inflate/deflate the mattress. However, the pumps can be as loud as a vacuum cleaner or even a hair dryer, which is not desirable. Air mattresses are thick and can take up too much space in the tent or even all of it in some cases. Camping cots may occupy just as much space but make up for it by providing an under-the-bed storage space for your camping gear such as hiking boots. When storing or transporting, air mattresses are the easiest and the most convenient. Simply deflate, fold and put them into their storage bags. The process is made even easier when you have internal electric pumps to help with the deflation. Air mattresses take up very little trunk and storage space. Camping cots have rigid frames that take up a lot of trunk space even when folded. They are heavy and bulky thus may not be practical for backpacking or hiking. With regards to storage and portability, camping cots are best suited for RV and car camping. Sleeping positions vary from one individual to the other. According to a study by Anna’s Linens, 74% of people in the US sleep on their sides, 16% on their stomach and 10% on their backs. Regardless of preferred sleeping position, your sleeping system should offer comfort and support for a good night’s sleep and long-term health benefits. For side sleepers, the sleeping surface should have medium firmness for better conformity to your body shape without putting too much strain on the shoulders and hips. An air mattress with medium firmness can provide the necessary support and comfort for a side sleeper. The fabric in a camping cot forms a taut surface when you lie on it, which may not be ideal for side sleepers. Sleeping on your back is regarded as the best sleeping position since your spine is properly aligned with your neck and head in a neutral position. Therefore you would require a firm sleeping surface plus a low-profile pillow to maintain this alignment. A camping cot excels in this and is more tailored for back sleepers. Stomach sleepers put a lot of strain on their spine and muscles and thus it is important to pick the right sleeping system to alleviate this problem. An air mattress with a memory foam top layer is best as the foam easily conforms to one’s body without foregoing on comfort. Being too close to the ground compromises on proper air flow and heat retention that’s why sleeping pads make poor sleeping systems for camping. Cold weather will mean the ground is just as cold or even more thus a sleeping system too close to the ground will be problematic. An insulating material like a foam strip can be placed on top of the air mattress for double protection against the cold. A self-insulated air mattress can be a less bulky option but in general cold air might still find its way into the mattress. Airbeds provide about a 3 to 4 inch elevation from the ground. When it’s raining, water may pool under the tent thus an airbed may not offer enough protection against such discomfort. Camping cots have heights varying from 4 to 22 inches, which is well-off the ground. The elevation allows for the much-needed airflow which is especially useful in cooling you off during hot weather. It also keeps you off of water during rainy conditions, but can exacerbate heat loss during cold weather conditions. Back pain occurs to over 80 percent of adults at any point in their lives. People of ages 30 to 50 are the most afflicted by this problem. It worsens when one puts too much strain on the muscles or back. Camping cots can help lessen the strain involved while standing up from a ground level sleeping system like an airbed or sleeping pad. Air mattresses have the best design for a shared sleeping system. They come in low-profile or raised styles and are available in many sizes be it twin, queen or king sizes. Camping cots on the other hand are built mostly for use by one person and thus maybe impractical to share with another person. However, if the tent space is big enough, cots are available in various sizes and heights i.e. heights from 4 to 22 inches and sizes from Junior (52L × 22W inches) to Jumbo/King (84L × 40W inches). If you frequently toss and turn at night, a cot with a bigger width might be more appropriate. The durability of the sleeping system is also another key factor to consider, ideally you want one that will withhold its structural integrity during use, transportation and storage. Air mattresses are generally not very durable. They can easily get punctured by sticks or sharp objects plus they tend to loss air overnight due to faulty valves among other reasons. An airbed with a thicker PVC layer can help avoid tears, seam splits and general air leakages. Notably, some air mattresses utilize an inbuilt coil system to stabilize the mattress, improve lumbar support and avoid sagging. This feature tends to prolong the life of the airbed a little longer. Camping cots are the most durable and sturdiest sleeping system. They are made with aluminum frames covered with rugged fabrics for guaranteed longevity and strength. You can also get a steel-framed one for extra sturdiness and durability. Make sure to lubricate the moving parts of the frame to prevent squeaking. Broadly speaking, air is a poor conductor of heat and works perfectly as a barrier of heat transfer through either convection, radiation or conductive means. Thermal resistance of air mostly depends on the thickness and height of the involved cavities. An increase in either results to an increase in heat transfer especially through convection and conduction. 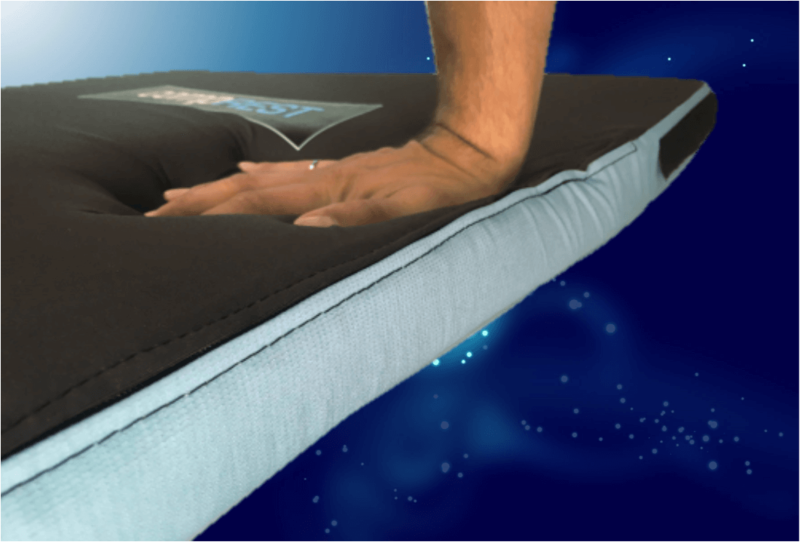 In cold weathers the airbeds may not transfer too much heat from your body or the other way round. In hot weathers, a proper airflow is needed to keep you cool throughout the night. Air mattresses do little towards this as they don’t allow for adequate heat transfer away from the body. An air mattress tends to be perfect dry weather free from precipitation. A pad with a high R value placed on top of the airbed can help provide more insulation and cushioning. The space left in camping cots allows for airflow, which is important for heat loss during hot weathers. On the downside you may experience the draft from under the tent during cold weathers. To prevent this, simply use a bed cover that goes all the way to the ground to keep the cold air off. With very minor tweaks camping cots offer the best all-weather sleeping system. A foam mattress, down sleeping bags and/or wool blankets can help keep you warm. Airbeds have been found to offer relief from back pain. This is mainly due to the adjustability of their firmness to accommodate various body shapes, weights and sizes. Additionally, airbeds made with materials free from VOC compounds lower the risks of allergies. Notably most air mattresses have a plastic odor due to the PVC material, which may be bothersome. The plastic material in most airbeds becomes very squeaky and annoying with any body movement. The air mattresses also tend to slide around with any body movement unlike cots which have sturdy support that doesn’t allow such movements. 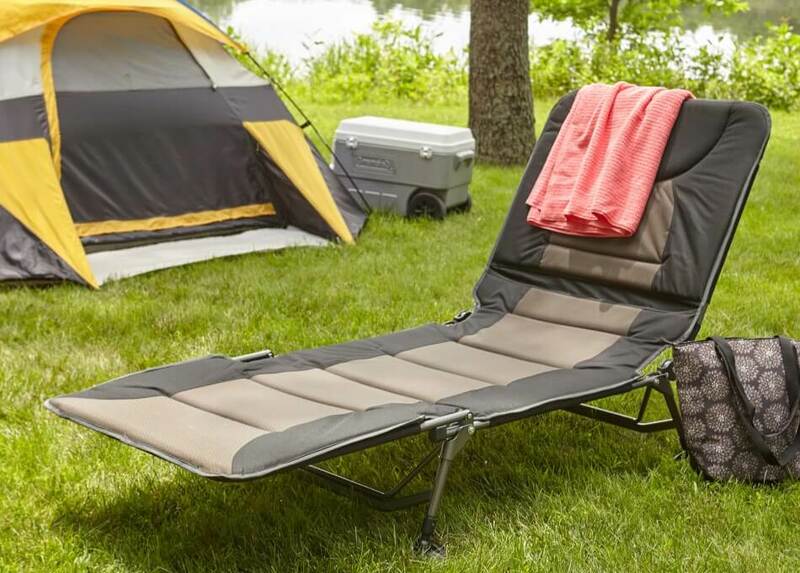 Camping cots are designed just like regular beds, this means you can get in and out of bed easily, and you can sit on it and even dress up with much more ease. Some camping cots even convert into benches for out of the tent use, which can be very useful. You also get pockets sewed in the cots for organizational purposes. 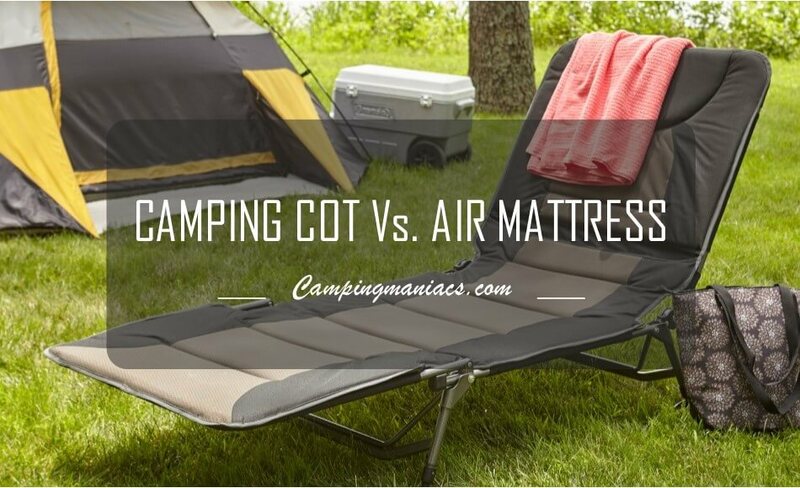 The debate on camping cots and airbeds is an age-old “war”, among camping enthusiasts, that is mostly hampered by opinions rather than hard facts. Clearly, either of the two have their own advantages and disadvantages thus making the choosing even more grueling. That said, enjoying both worlds –a camping cot with an airbed or a sleeping pad– is more than recommended as long as you have enough space.